This article serves as an addendum to the Staff Logins and Access article. HoudiniEsq makes managing your staff’s data access easy. When logged in as an Administrator, simply access the Settings menu by selecting the gear icon at the top right. 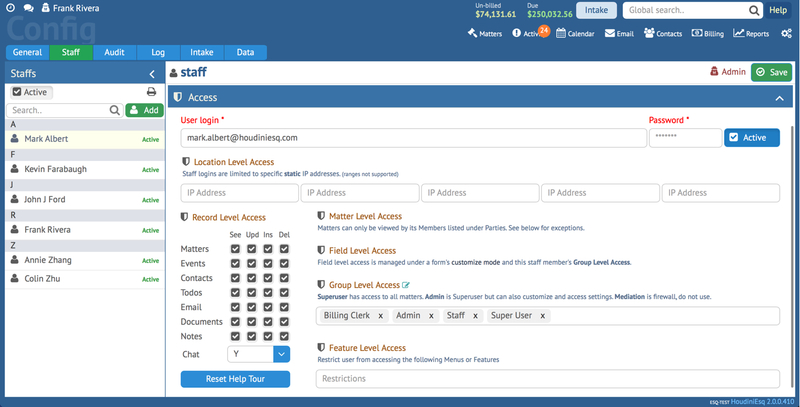 Then select the Staff tab and select a user, and click the Access panel as noted in the screenshot below. This article will focus on specific types of user access. First is the Location level access. This setting will allow you to add up to 5 IP addresses to whitelist; these IP addresses will be the only ones which this Staff member will be allowed to log into the program from. Do not use this feature unless you are absolutely certain those IP addresses are static. Next we will talk about Matter level access. This can be managed using Group Level Access in the field below, or by adding Staff to a Matter. The exceptions to this rule are members of the Mediation group and Super User. We do not recommend using Mediation as it is an advanced group and will block access to most Matters in the system. Super User will allow Staff to see all Matters in their Matter Dashboard. However, the ability to manipulate that Matter’s data will ultimately be set in the Record Level Access grid which we will describe below. Specific data fields can be assigned in Customize Mode to be available to only members of certain Staff Groups, or hidden completely from all users. For more information about how to set these options, refer to the Customize Mode KnowedgeBase Entry. Staff – All users are added to this group by default.It is a general purpose group that can be used by automated processes to assign records to every staff member in the system. Admin – Admin lets the user access the Settings menu and allows users to switch any form into Customize mode. This toggle also allows users to restore deleted records in the Matter and Contact Dashboards. Billing Clerk – This will let the staff member access billing information on Matters they are not a matter member of in the Billing section. 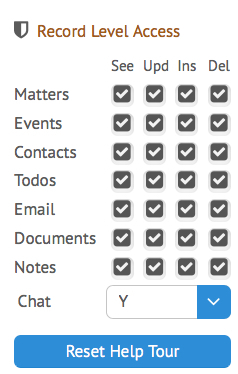 Super User – This lets the staff member see ALL matters, events, and contacts in the system. Mediation – A Firewall that locks out staff members from seeing matters. This is an advanced role meant for a unique type of assignment. It is not recommend to click when setting up a new staff member. Additionally you can add additional Staff groups to this list by entering the value you want to add and pressing the Enter key. For more information on this process, review the KnowledgeBase entry on editable fields and lookups. These Staff groups can be used for Field level access permissions and/or restrictions as well as assignment through Workflows and automated processes. You can also restrict access to specific features of HoudiniEsq for certain users. Keep in mind that if a feature is selected in this box, the user cannot access it at all. These areas are the Billing, Reports, Word Templates and Matter Assignments. Billing – This feature removes all access to billing in HoudiniEsq, including the ability to access Matter financial information from the Matter form. Reports – This restriction removes the ability for the user to access the Reports menu. This is an “all or nothing” option, for more fine-tuned Report restriction on BIRT reports, view the appropriate KnowledgeBase article to learn how to restrict reports to specific Staff Groups. Word Templates – Restrict the ability to modify current document templates in the Word plugin. Users with this restriction can still generate document templates in Word or HoudiniEsq. Matter Assignments – Restrict the ability to change the assigned Staff on a Matter, as for various reasons you may wish to have a Staff member able to edit a Matter’s information but not change the currently assigned Staff on that case. You can select or de-select any of these options in the drop down menu. View – The selected user can view records of this type in their specific dashboard sections. Edit – The selected user can make changes to records of this type. Insert – The selected user can add new records of this type to the system. Delete – The selected user can delete records of this. By default, this is turned off. Keep in mind that certain types of records (such as Matters) can never be completely deleted from the system as a safeguard. Chat Toggle – This toggle enables or disables the user’s access to the chat feature. Reset Help Tour – This button will reset the built-in Help Tour options, allowing them to once again walk through the application’s initial help screens.